Well defined processes are the key to becoming a responsive, agile enterprise. 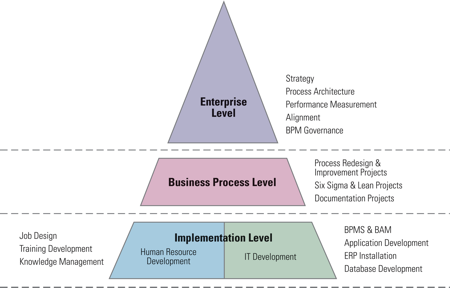 Business Process Management (BPM) is a comprehensive approach to improving corporate performance by aligning business processes with business strategy and goals and assuring that IT applications, human competencies and organizational development support the process performance objectives of the organization. BPTrends Associates is a global services company providing the education, training, mentoring and consulting support required to architect, design, manage and measure an organization’s business processes at the strategy level, the process level and the implementation level. The result is a process-centric organization with processes that are integrated, well-defined, visible to management, and measured and managed against corporate strategy and goals, enabling organizations to achieve sustainable improvement in operational performance. The BPTrends Associates Methodology is based on the practical experience and research of BPTrends Associates and founders, Paul Harmon and Roger Burlton, two of the most respected thought leaders in the BPM community. The breadth and depth of our offerings and the knowledge and experience of BPTA and founders, subject matter experts, consultants, instructors and licensed partners around the world are the key to ensuring the ongoing success of our programs and our clients’ results. The entire BPTA BPM curriculum was revised in April 2016 based on market research, feedback from BPM thought leaders, our global partners and clients in the international BPM community. Addressing market requirements and current BPM Trends, our BPM programs are now more robust and rigorous, and are designed to support a global industry standard. The BPTrends exams are available online, free of charge, after completing the required curriculum programs, and the BPTrends Certificates are awarded immediately upon passing the exam. BPTrends Associates is an affiliate of BPTrends.com. BPTrends.com was founded in 2002 and is the most comprehensive, in-depth business process management resource available. Industry thought leaders provide analysis and opinion on trends, directions and best practices relating to all aspects of business process management. All publications are archived, available and searchable by topic. With over 20,000 members world-wide, BPTrends.com is the largest community of BPM professionals in the world. Membership is FREE.